paid till 31th of January 2019! 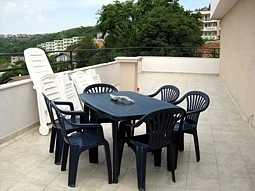 This lovely, self-catering, apartment is located in Saint George Complex - a private residence situated on a top of a hill in the tourist sea area of Kavarna city, only 5-10 minutes walking distance from the sandy beach. The beach can be reached by car as well for only 2 minutes and the benefit is that there is a large free of charge parking on the beach. 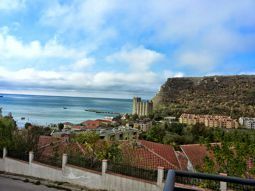 The beautiful bay and beach Bolata is located only 10 minutes drive from Saint George Complex. 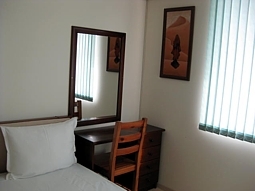 The apartment is comfortable for families with kids or friends groups – 4 maximum 5 people. 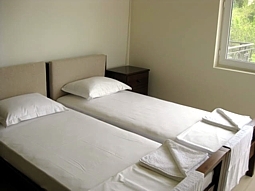 The apartment offers two large fully fitted bedrooms – one with double bed, night tables, wardrobe and air-conditioner; the other one with twin bed, chest of drawers and air-conditioner. 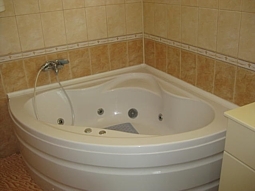 The flat is serviced from two bathrooms - one with full size bath and another one with a Jacuzzi bath and both with wash basins and toilets. An entrance-hall is leading to a large spacious open-plan living room with comfortable sofa-bed /where one more person can sleep/, coffee table and air-conditioner; dinning area with table and six chairs, TV set connected to a Cable TV /many foreign and Bulgarian programs are available/, DVD player and WiFi internet connection; as the apartment is self-catering it has the benefit of a fully fitted modern kitchen with breakfast bar – fridge with a freezer, washing machine, oven, hot-plates, microwave, toaster and all needed pottery. 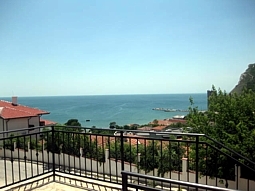 A very large terrace /equipped with plastic table and chairs/ with a magnificent sea view is overlooking to the complex swimming pool and the sea. Very early in the morning you can see the dolphins close to the shore. Linens for all beds and bath towels are provided. The apartment is located on the fifth floor and the building lift stops directly in the apartment. The guests of the residence benefit from all facilities such as swimming pool with sun-beds and umbrellas, fitness and sauna centre, 24 hours security and concierge services. Wide range of additional services, sport and cultural activities are available on request in order to spend your unforgettable journey abroad. Additionally as guests of Saint George complex you will take the advantage of 10% discount vouchers for one of the best restaurants in the area, called "Balgarka" and located on the beach.